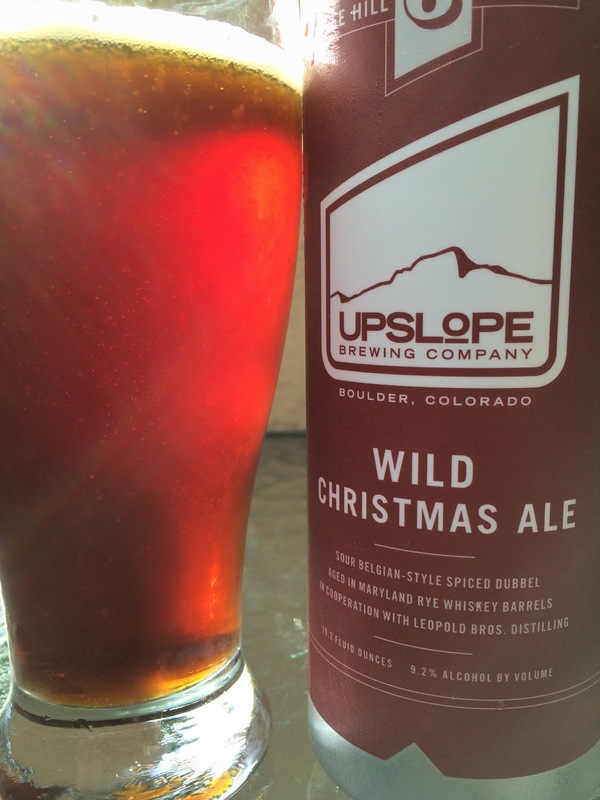 Upslope Brewing's newest Lee Hill Series experiment is a barrel-aged version of their Christmas Ale. 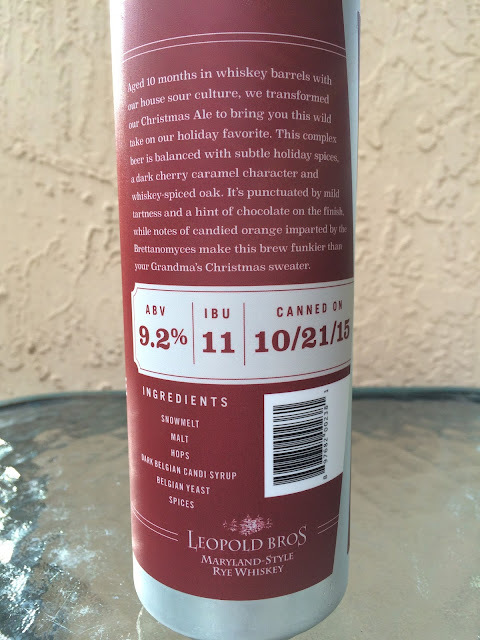 Wild Christmas Ale isn't just wild because of its 10-month barrel aging in Leopold Brothers Rye Whiskey barrels. The brewery also tossed in their house Brettanomyces to "make this brew funkier than your Grandma's Christmas sweater." Giant 19.2 oz can full of information including ingredients. A few stories on the label explain this beer, set your expectations, and tell you more about their Lee Hill Series. 9.2% alcohol. 11 IBU. 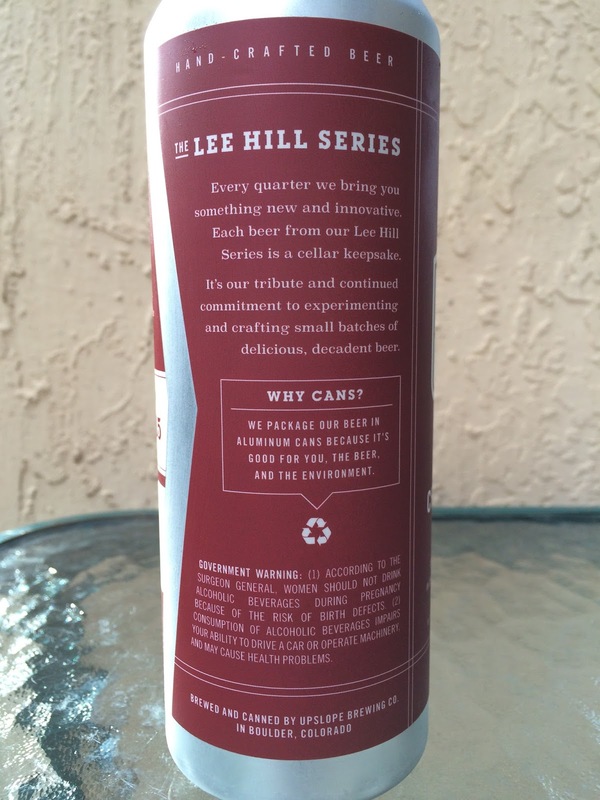 Canned on 10/21/15. Tons of cherry and candy sweetness in my nose right when I cracked open the can. Also very spicy and full of whiskey and rye. Nothing really sour in the aroma though. HOWEVER, there is absolutely zero doubt they added in a healthy culture of Brett into this beer! I made that sour face big time! Several times! In conjunction with the sour-forwardness, tons of tart cherries and sweet malty caramel come through. Cherry has a cola and semi-cough syrup character, not to the point of being off-putting. Belgian character. Candi sugar sweetness. Spicy and woody. The alcohol definitely kicks in, especially at the finish and especially after drinking a handful of sips. A little heat in the throat but not an issue. You'll likely get used to the sourness a little but it doesn't just become forgettable. Sweet and sour, good flavors, grew on me though I'd still say half the can is all I wanted and you should definitely share the big can. Not quite as Wild as the Christmas my uncle got into a fist fight with his brother, breaking his hand and forcing a withdrawal from the skiing vacation. Not as Wild as the Christmas my sister and I did take down practice in the front yard of Miami home, sparking a security inquiry. Yet you will definitely feel the wild cultures in this beer throughout! Check it out!